Heavy rain and cold weather during the harvest. Each variety is harvested manually and separately. Vinification is completed in truncated oak barrels for the reductive grapes (Mourvèdre and Syrah) and in traditional tiled cement tanks for the oxidative grapes (such as Grenache). After the malolactic fermentations, the family blend the different varieties and then the wine ages in oak Foudres for a year before being bottled. A tile-red colour with beautiful tints of red. The nose is discreet with notes of bay leaves, caramel and leather. Very elegant mouth with a dense texture and notes of leather. This is a full bodied wine. This 1992 is characterized by its great freshness. A pleasant surprise for this small vintage, very subtle. The volume is moderate, balanced, young. This wine will reveal all its best assets today. Serve without decanting. A vintage ready to drink now. Oriental notes and nougat flavours. This wine has characteristics of a warm year and will go very well with spicy dishes. Stand the bottle upright 48 hours before serving to avoid any deposit. A light, elegant version of Châteauneuf, with interesting leather and earth aromas, bright cherry and blackberry flavors and a lingering finish. 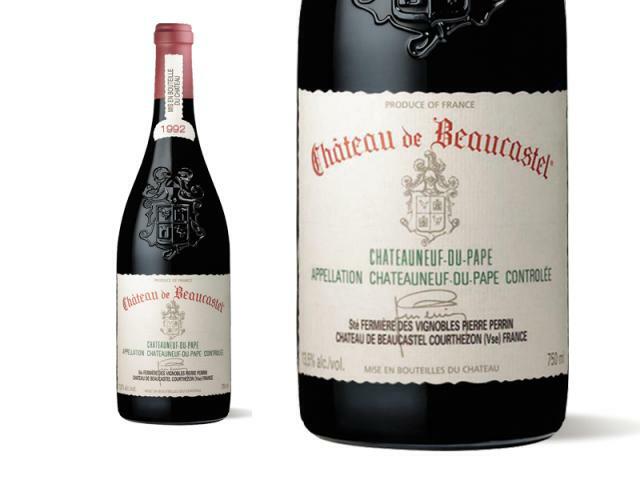 I was impressed with the 1992 Beaucastel, which is significantly richer and more complete than the narrowly constructed, herbaceous, compact 1991. The 1992 boasts a smoky, earthy, peppery, cassis-scented nose, rich, full-bodied flavors, excellent depth, moderate tannin, and a sweet, chewy, impressive finish. Its firmness suggests 3-4 years of cellaring is necessary; it should keep for 20 years.